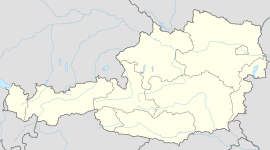 Waidring is a municipality in the Kitzbühel district in the Austrian state of Tyrol located 20 km northeast of Kitzbühel and 9 km east of Kirchdorf in Tirol near the border with Salzburg. The village was mentioned for the first time as „Waitheringen“ in documents from 1147. Wikimedia Commons has media related to Waidring. This Tyrol location article is a stub. You can help Wikipedia by expanding it. This page was last edited on 26 March 2019, at 16:04 (UTC).